The sixteenth annual Dancing Fox will include a Tudor Banquet by Lady Ailionora inghaean Ronain. You may have read her two recent articles on the Tudor Banquet in Ars Scientia Orientalis. Now you can eat her words! 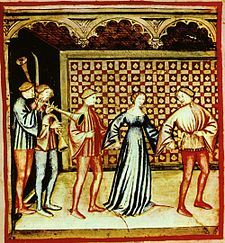 Additionally the event will feature music from the Bhakaili Branslers and dance instruction from Lady Lorita and others, a Roman feast researched and executed by Lord Tiberius Nautius Maximus. A Dessert Challenge by Mistress Brigitte, Dressing the Fox, The Ultimate Proposal Game and a Quilt raffle. The Honorable Lady Margherita Battistina is Dean of the School of European Dance. Gazette: What Pennsic activities does your office cover?